Diageo has revealed further plans for the revival of Port Ellen distillery on Islay as part of a public consultation today (29 January). The plans, which are due to be submitted to Argyll and Bute Council for approval later this year, were unveiled today at a pre-planning consultation in the village of Port Ellen, allowing local residents to view the proposals and share their own memories of the distillery. Diageo revealed its intention to reopen Port Ellen distillery in October 2017, with a view to having the site operational by 2020, however the opening date has now been pushed back to 2021. 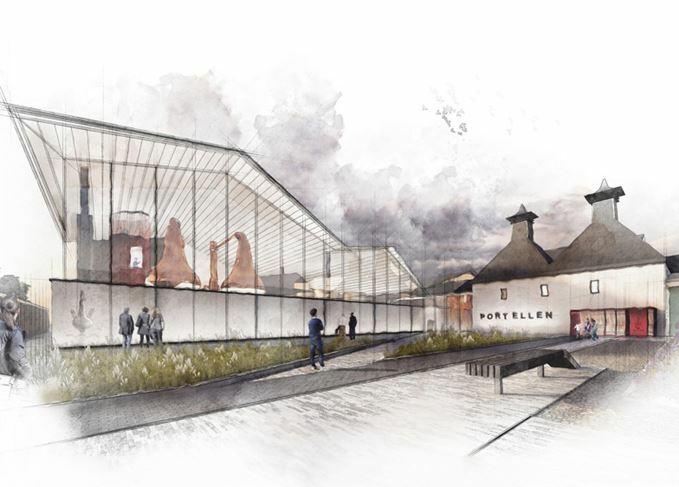 Among the plans is an outline of how the distillery will look once building work is completed, as well as details of two separate distillation regimes. Since its closure in 1983 only Port Ellen’s kiln building with pagoda roof, and its seaside warehouses remain – many of the original buildings were demolished in the 1930s, and then partly rebuilt in the 1960s. Diageo now intends to fully restore the remaining buildings and erect a new still house, which will house two pairs of copper pot stills. One pair will be closely modeled after the original Port Ellen stills so as to recreate the distillery’s spirit character. The second, smaller pair of stills will be used to create ‘alternative spirit characters’ that will allow Port Ellen to ‘experiment with new whisky styles. Georgie Crawford, project implementation manager for Port Ellen, said plans to revive the distillery are ‘any whisky maker’s dream come true’. The new ‘spacious and modern, light-filled’ buildings, which will house all the process equipment, will be erected around a central courtyard, with the existing kiln and warehouses ‘restored and reimagined’. Crawford added: ‘Like the whisky, the plans for the building combine the best of heritage and innovation. ‘The buildings at Port Ellen distillery have changed and evolved many times over its lifetime. Port Ellen’s refurbishment is part of a £35 million investment by Diageo in resurrecting the Islay distillery, as well as the Highland distillery of Brora which also closed in 1983. Diageo is also investing an additional £150m in improving its Scotch whisky tourism facilities, including upgrading its 12 distillery visitor centres and the establishment of a flagship Johnnie Walker experience in Edinburgh. Although Port Ellen first opened in 1824, its resurrection could see it become the 11th distillery to operate on Islay, following the recent opening of Ardnahoe, and the planned as-yet-unnamed distillery at Farkin from Elixir Distillers. Planes, trains and automobiles as Dave Broom leaves County Cork for the pleasures of Port Ellen. The latest moves on ‘Whisky Island’, including new, revived and expanding distilleries. Three more of Port Ellen’s legendary annual releases, all from 1979, come under the spotlight. Dave Broom revisits three legendary Port Ellens, but wonders if the liquid is worth the hype. A delve into the Islay vaults nets a 1980s Bruichladdich, a recent Bowmore and a quirky Port Ellen.